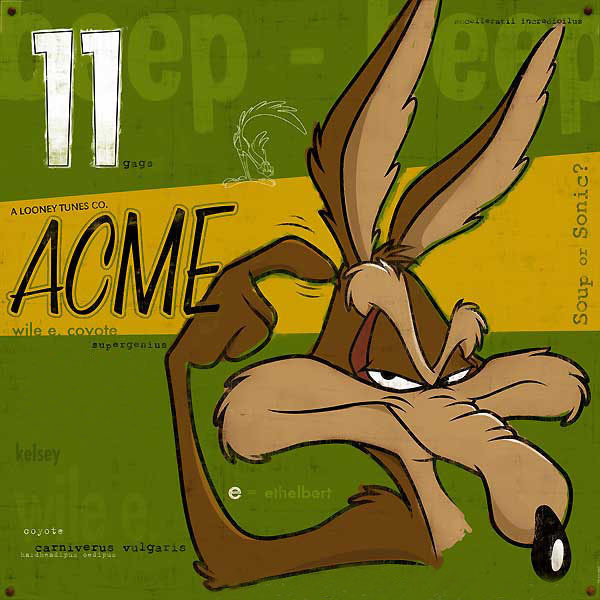 First conceptualized in 1948 by Chuck Jones, Wile E. Coyote has appeared in 42 Looney Tunes cartoons with Road Runner. The unusual border on the canvas version features vignettes of Wile E.’s classic confrontation with the Road Runner. The suggestive hints in the piece offer insight into Wile E’s character. For instance, “Ethelbert” is Wile E’s middle name, and 11 represents the number of gags in many of the Road Runner/Coyote cartoon shorts. Signed by the artist Michael Cole.